The National Academy of Sciences (NAS) recently published a report entitled "Scientific Criteria to Ensure Safe Food." If you haven't heard about this report yet, there's a good chance you will in the future. The report was commissioned by Congress in 2001 to provide scientific recommendations on food safety criteria, particularly in the area of performance standards. Among other reasons, the report is of interest because it is likely to prompt new legislative authority for the U.S. Department of Agriculture (USDA) and U.S. Food and Drug Administration (FDA) to regulate food safety. Congress asked NAS for its views on this issue following a successful legal challenge to USDA's performance standards for salmonella in Supreme Beef Processors, Inc, v. USDA (275 F.3d 432). The performance standards in question were adopted in 1996 by USDA's Food Safety and Inspection Service (FSIS) and were included in a rule that required meat and poultry plants to institute a Hazard Analysis Critical Control Point (HACCP) System in order to reduce the occurrence of harmful bacteria on related products. 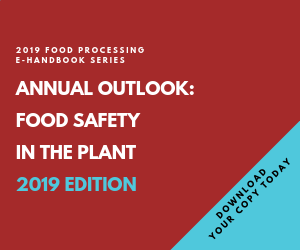 FSIS regarded the performance standards as an important tool to improve food safety and monitor whether individual meat and poultry plants were successfully implementing a HACCP system. The salmonella performance standard required slaughter establishments to reduce the incidence of salmonella contamination of meat and poultry below national baseline prevalence. For example, in the case of ground beef, the Salmonella performance standard was established at no more than 7.5 percent of samples testing positive. FSIS conducted salmonella testing in slaughter establishments to determine whether they were meeting the performance standards. If a particular establishment failed to meet the performance standards in three consecutive series of tests, it's efforts to maintain sanitary conditions were deemed a failure, prompting FSIS to suspend inspection services at the plant and effectively shut down operations. In the Supreme Beef case, a slaughterhouse challenged the salmonella performance standard as exceeding USDA's statutory authority, and the court agreed. USDA cited as its statutory authority the Federal Meat Inspection Act, which provides that a meat product is adulterated "if it has been prepared, packed or held under unsanitary conditions whereby it may have become contaminated with filth, or whereby it may have been rendered injurious to health." As the appellate court succinctly stated, "The regulation fails, but not because it measures salmonella levels and salmonella is a non-adulterant [often present in meat and destroyed upon cooking]. The performance standard is invalid because it regulates the procurement of raw materials." In other words, because raw materials may have been contaminated before they entered a slaughterhouse, USDA cannot logically conclude that failure to meet the salmonella performance standard means a facility is operating under unsanitary conditions. Following the Supreme Beef decision, USDA stated that it would continue to test for salmonella and enforce its HACCP rule. It is clear, however, that at least in the area under the jurisdiction of the U.S. Court of Appeals for the Fifth Circuit, USDA currently cannot shut down an establishment only because of failure to meet the salmonella performance standards. It was against this backdrop that Congress asked NAS to study and prepare a report on scientific criteria to ensure safe food. Chief among the conclusions in the NAS report is that Congress should grant the regulatory agencies, i.e., USDA and FDA, "clear authority to establish, implement, and enforce food safety criteria, including performance standards, and the flexibility needed within the administrative process to update these criteria." In the case of USDA, this would mean that the agency would be in a position to enforce its existing performance standards, including the salmonella standards, even though salmonella is arguably not always an adulterant when present in raw meat intended for cooking; it is at times only a marker that tends to suggest a product has been exposed to unsanitary conditions at some point in its history. In the case of FDA, the agency might be authorized to incorporate performance standards into its own HACCP rules, such as the HACCP rules for seafood and juice. Performance standards would also likely play a role in any future HACCP rules established by FDA for other categories of food. One subject the report unfortunately does not address is the excessive regulatory oversight experienced by manufacturers of antimicrobial products that may enhance food safety. A manufacturer seeking to introduce a new antimicrobial intended for direct application to food often experiences an astonishing regulatory maze. A single product when used in a single application may require regulatory clearance by FDA, USDA, and the Environmental Protection Agency (EPA). Even after FDA has issued a food additive regulation authorizing use of a new antimicrobial, its distribution in commerce may be prohibited until EPA has issued a pesticide registration for the same product. The result is that it may take years to introduce a new antimicrobial for use in food applications. One of the fastest and easiest ways to enhance food safety would be to streamline the regulation of antimicrobials and recognize that these substances, often present in finished food in low part per million (ppm) quantities at best, do not require the extraordinary level of regulatory scrutiny they are receiving. Looking at the current allocation of regulatory resources, one might conclude that some regulators would rather see dangerous microorganisms in food than low ppm quantities of antimicrobials.